Congratulations on your Kindergarten placement with PS 452. We are excited to have you pre-register your child with us. 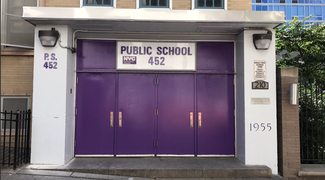 You will come to PS 452 at 210 West 61st between Amsterdam Avenue and West End Avenue. Please sign up with your child's name for a 30 minute time slot. Bring a photo identication with you to sign in with school safety in the main lobby. Contact Sharon Lustig, PS 452 Parent Coordinator, with any pre-registration questions at [email protected] .